Alexandria Ocasio-Cortez's victory as an open critic of the Israeli Occupation may be a new bellwether in American politics. First published at From the River to the Sea. The brilliant National Lawyers Guild attorney and Palestinian activist Lamis Deek tweeted “NY just got its 1st anti-Apartheid congressional rep. Expect her to be the 1st of many” after Alexandria Ocasio-Cortez’s stunning electoral upset of Democratic Party incumbent Joe Crowley last night. Ocasio-Cortez still must win in the general election, but her victory as an open critic of the Israeli Occupation may be a new bellwether in American politics. Ocasio-Cortez is a Puerto Rican working-class woman whose political life and career has been formed in the age of pro-Palestinian insurgency in the US. This would include the Boycott, Divestment, Sanctions campaign against Israel, launched by Palestinian civil society in 2005, in the US in 2009, and since 2013, a site of numerous votes — from college campuses to the Presbyterian church to the United Electrical Workers — to boycott or divest from Israel. Ocasio-Cortez’s political vision has also been shaped by the Black Lives Matter Movement, which since Michael Brown’s killing by Ferguson police in 2014 has openly embraced Palestinian civil rights: see the Black for Palestine statement signed by more than 1,000 Black intellectuals and activists; the platform of The Movement for Black Lives, which includes an open endorsement of the Boycott, Divestment, Sanctions Movement against Israel; and, significantly, the endorsement of BDS by Ocasio-Cortez’s own party — Democratic Socialists of America — at its annual convention in 2017, a vote driven by young cadre in the organization much like Ocasio-Cortez. Indeed, Ocasio-Cortez’s statements on recent catastrophic events in Palestine have been well to the left of even the figurehead of the the Democratic Party’s left flank, Bernie Sanders' “Our Revolution." 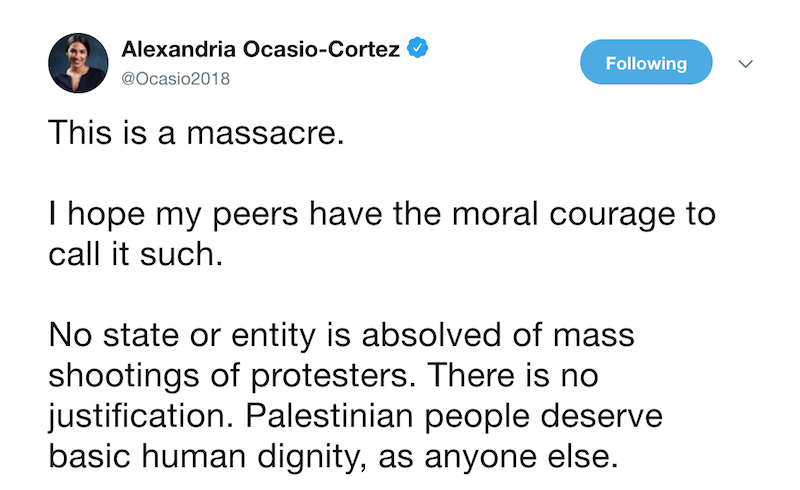 After Israel gunned down dozens of protesters during the “Great March of Return,” Ocasio-Cortez tweeted, “This is a massacre…No state or entity is absolved of mass shootings of protesters. Democrats can’t be silent about this anymore.” Ocasio-Cortez has also openly criticized the Trump administration’s move of the US embassy to Jerusalem, (“where 60 people died”) she tweeted. Asked later why she chose to post the tweet, Ocasio-Cortez compared the Gaza protesters to civil rights activists in the United States. “I think I was primarily compelled on moral grounds because I could only imagine if 60 people were shot and killed in Ferguson. Or if 60 people were shot and killed in the West Virginia teachers’ strikes. The idea that we are not supposed to talk about people dying when they are engaging in political expression just really moved me,” she said. She told interviewer Glenn Greenwald that the “silence” around the Palestinian cause “has been a little interesting to me,” adding that her Puerto Rican roots her to relate to the Palestinian protesters. This is not the language of mainstream liberalism, or the Sanders wing of the Democratic Party. Ocasio-Cortez is using the example of US settler-colonialism in her native Puerto Rico to highlight the violence of Israeli setter-colonialism. She is using the memory of violence against the working-class in America — from the Haymarket rebellion to the Battle of Blair Mountain in Matewan, West Virginia — to configure Palestinians as part of a labor international. Analogizing the Great Return March to the figurative killings of striking West Virginia teachers also demonstrates her understanding of historical conjuncture: Ocasio-Cortez is arguing for the right to Palestinian self-determination as part of a universal struggle for social and economic justice under capitalism and colonialism wherever and whenever it exists. Ocasio-Cortez is now likely to feel significant pushback from the Democratic Party apparatus for her victory, and the road to reform of the Democratic Party is not only long, but impossible. What is possible is that Ocasio-Cortez is giving an important independent voice to one of the most radical anti-imperialist currents in US politics these days, and that that voice will give confidence to a broader layer of activists to stake out more emancipatory positions on Palestine. Leftists should go all out in support of this aspect of her candidacy.